1440 p., 20,8 x 29,0 cm. In cooperation with Irmgard Schauffler and Eberhard Zwink. 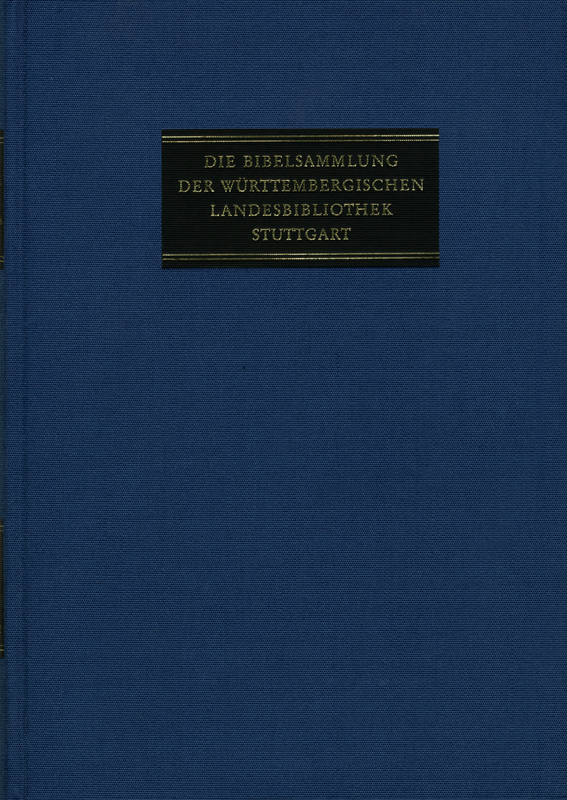 The Württembergische Landesbibliothek also has one of the largest collections in the world of Latin Bibles in print which make it possible to study the printing history of the Latin Bible text. The incunabula era is very well represented by 78 complete editions of the Bible. The complicated history of the revision of the Latin Vulgate Bible can be traced almost completely using the works in Stuttgart. The same is true of the dissemination of new Latin translations from the basic Hebrew and Greek texts. Of special significance for the history of biblical philology are the first editions of the Old Latin translation (Vetus Latina), which were printed in the late 17th and 18th centuries. In addition there are numerous annotated bilingual editions with French, German and Italian translations from the 17th to the 19th century. The descriptions in the catalogue include the stages of revision and contextual dependencies, identify the literary and artistic contributors and list the individual characteristics of each book. The volumes contain several indexes.